There are a few features that distinguish eukaryotic cells from their less evolved contemporaries, the most notable being the presence of intracellular membrane-bound organelles, such as the endoplasmic reticulum (ER) and Golgi apparatus. Various biomolecules are shuttled between these intracellular compartments by vesicles roughly 100 nanometers in diameter. The vesicles are part of the canonical intracellular trafficking pathways that are defined by the coat proteins that constitute their outer coat. For example, vesicles that follow the Golgi to ER trafficking route are covered in the coat protein complex I (COPI), ER to Golgi traffic is made up of COPII protein coat, and Golgi to plasma membrane traffic contains clathrin-coated vesicles. Now, researchers from the European Molecular Biology Laboratory (EMBL) have assembled detailed images of the intricate protein-coat that surrounds the Golgi to ER vesicles. The investigators employed a technique called cryo-electron tomography where samples can be frozen at extremely low temperatures in order to avoid fixing or staining artifacts that can often occur from standard electron microscopy sample preparation. The scientists took images from hundreds of vesicles and combined them to create a 3D image of the COPI coat—allowing them to produce some of the most detailed images to date of a completely assembled vesicle coat. Once the EMBL team began to analyze the assembled 3D images they found some surprising results. 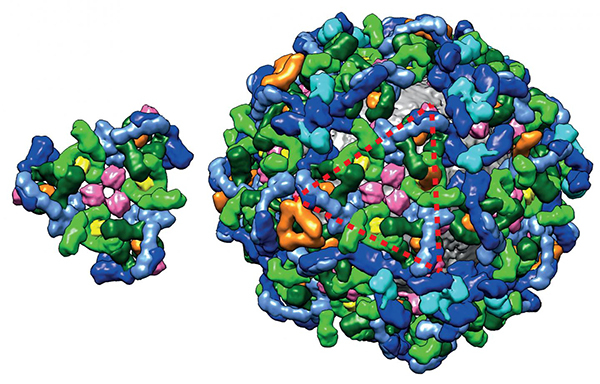 It had been thought that the COPI coat was similar to other vesicles, in that the proteins were assembled in different layers around the vesicle membrane. However, the researchers observed that the proteins in the COPI coat were all interwoven together in one large layer that curved to fit the vesicle membrane. Specifically, the scientists noted that the COPI coat was made up of repeating units of building blocks they called triads, which contained all of the critical functional elements arranged in a unique 3D structure.